During the Apple WWDC event 2013 at San Francisco today, Apple launched the new version of the Apple Macbook Air, which comes with the same screen size but the advanced features and improvements which include a newer processor and better battery life, apart from a few. Check below for all the details. Apart from this, there was even the announcement of the Apple Mac OS X Mavericks. New Macbook Air to have all-day battery life. The new processor: Haswell ULT. It’s a great processor for battery. 11-inch will get 9 hours, 13-inch will get 12 hours. Up to 10 hours of iTunes movie playback. 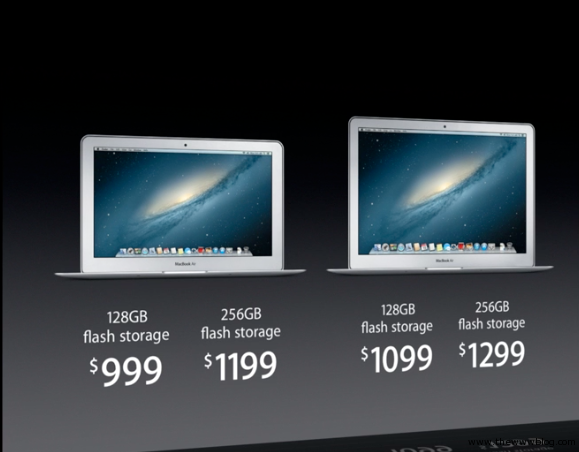 Flash is 45% faster than earlier versions of the Mac Air. 802.11ac Wi-Fi which is 3 times faster than the other types of 802.11 connectivity of Wi-Fi. New AirPort base stations, entirely new designs. 4 inches by 6 inches. New Time Capsules — 2TB or 3TB hard drives.